Click on compressed sizes for details. Red bold value indicates that no compressor with higher quality is faster. 45 images (1208 Mb) from http://photojournal.jpl.nasa.gov. More details on test data. 20 Apr 2011 - added NK2 and compression time for APT and StuffIt. Started testing DLI, first with -q 100 -qc 80 -ac. 03 Jul 2011 - Everything was re-tested with the updated data set. Previous version of LPCB main page is here. This time more efforts were made to minimize the influence of HDD speed. New versions of programs this time: WinRAR 4.01, PGF 6.11.22, DLI 2.2, NConvert 5.91.
was tested (on a different computer), therefore times are approximate. Page More details on test data was updated. 13 Jul 2011 - Added FLIC 1.5.demo. 15 Jul 2011 - Added GraLIC 1.10.demo. 17 Jul 2011 - Compiled pages Top 10 entries - more details and Top 10 entries - percentage. and because in the GUI version you have to press OK after each file, timings are very approximate. If it compresses images in BMP format, compression quality is not as good as with PPMs, e.g. 309976499 => 310621406 bytes (PPM=>BMP) on the Canon set. Flag "Use maximum compression"
was set in the options. If it is not, compressed size is ~4.5% bigger (the Canon set). 20 Jul 2011 - Updated GraLIC 1.10.demo and pages Top 10 entries/Percentage. 30 Jul 2011 - Added GraLIC 1.11.demo. 22 Aug 2011 - Added Qbit 1.0.0.10. It fails to losslessly decompress one file: canon_eos_1100d_11.qbt. 25 Aug 2011 - Added FLIC 1.6.demo. 03 Sep 2011 - Added FLIC 1.7.demo. 12 Sep 2011 - Added PGF 6.11.29, updated FLIC 1.7.demo. If you want to see the scripts used for testing software, please send an e-mail. 14 Sep 2011 - Added PNGOUT Jul 2 2011. 25 Sep 2011 - Added FLIC 1.8.demo. 05 Oct 2011 - Added LuraWave Format, LuraWave JPEG-2000 (NConvert+plugins), PSD and TDI (just NConvert, no plugins). 11 Oct 2011 - Added FLIC 1.9.demo. 14 Oct 2011 - Updated FLIC 1.9.demo. 31 Oct 2011 - Added FLIC 2.0.demo. 01 Nov 2011 - Added GeoExpress 8. Timings are based on outfile timestamps. "watermarked with small white "X"'s indicating that the imagery was created with the evaluation version". 09 Nov 2011 - Added NanoZip 0.09 alpha. 10 Nov 2011 - Now you can download test images from CompressionRatings.Com in GraLIC 1.11 format or in ZIP. 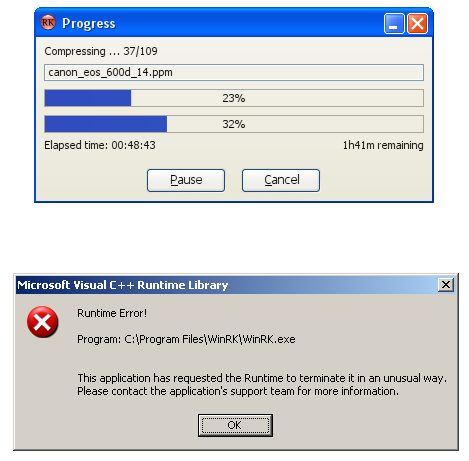 compression time is ~14% less, decompression is ~7% faster. 16 Nov 2011 - Added FLIC 2.1.demo. 23 Nov 2011 - Updated FLIC 2.1.demo and pages Top 10 entries/Percentage. 27 Sep 2012 - Added WebP 0.2.0. Compression time is approximate. With "-lossless -m 6" it crashes on image PIA13894. 03 Oct 2012 - Added ImageZero 0.1 (discussion) and RAR 4.20. 09 Nov 2012 - Added version 9 of the Independent JPEG Group software. 04 Dec 2012 - Added Quo Vadis JPEG released on 3-Dec-2012. It was compiled in Visual Studio 2008 - Release, no project settings were modified. 10 Jan 2013 - Added QLIC 1.demo, another image compressor written by Alex Rhatushnyak. 19 Jan 2013 - Replaced links to the latest NConvert with links to NConvert 5.91. 20 Jan 2013 - Added QIC 1.dem, a twice faster and smaller edition of QLIC. 02 Mar 2013 - Added BIM 0.02. 20 Apr 2013 - Added Kakadu 7.2. 19 Jul 2013 - Added WIC released on 16-Jul-2013. no project settings were modified except PlatformToolset = v110_xp. 29 Sep 2013 - Added BIM 0.03. Please send your comments to this group or to Alex Rhatushnyak: gralic1 (alpha) g mail d_o_t com. Discussions on the most active data compression forum: FLIC, Lossless image compressors.